If you ask me what excites me more than fancy parties and shopping for new shoes, the answer is—day trip with besties! This past Sunday My China Opportunity took our interns and their friends out on a day trip to the Summer Palace. Finally got into the park. Journey starts here! To three of our interns, Justin, Jonathan, and Ann, this is their very first outing in China since they just arrived last Friday. Immersing themselves in Chinese culture and experiencing as much as they can is the purpose of this trip. Long before the trip started Jonathan and Ann got themselves “in trouble.” As two newbies in town, not knowing much about the city, Jonathan and Ann hopped on the wrong train coming from their place to the park! Instead of taking the short path on the subway line, which is a circle, they went all the way to the other direction and stayed on the train for almost 30 stops. Hands up if you need to learn Chinese, Jonathan & Ann! The Summer Palace is always packed, especially Sundays; even the ticket box was surrounded by hundreds of people trying to get the tickets! However, Chris, our group leader who has been living in Beijing for almost four years, “strategically“ got the tickets for all of us with no waiting in lin. How so? He cut the line, just like any other tourist there, of course. 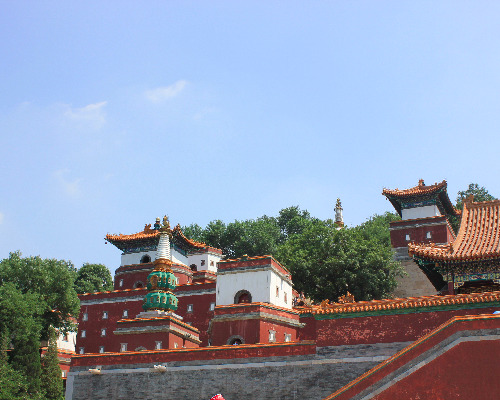 Even as a so-called Beijinger my memory about the Summer Palace is so vague and blurry. I’m so glad that after so many years away from home I got a chance to revisit this beautiful park once again. Waiting to get on the boat! Everything is fun when you do it with the right people. Our lovely interns made the hiking in the park a fun thing to do although the sun was not so friendly to us. It was interesting to see how our interns were amazed by little things happened around them. 90-year-old man training Kongfu in the park, the Buddha in the temple, trying the Chinese corn dog, “kidnaped “by Chinese tourists to take pictures with them, all of these things made the trip a memorable one to all of us, but the best part of the day has not come yet. The sun was still high when we left the park. Besides all the excitements and laughter we had on this trip everybody got a nice tan that was from the beautiful summer sunshine.